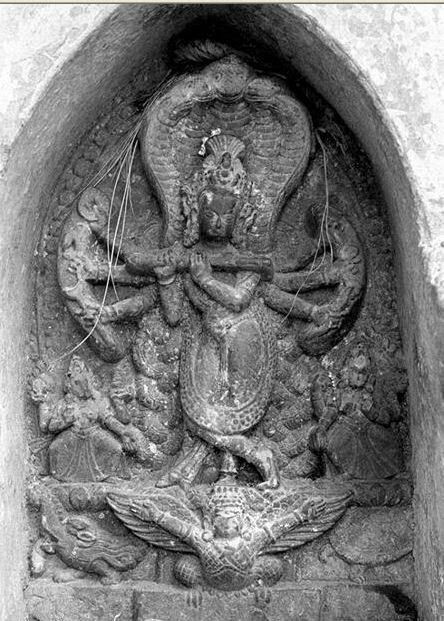 Scoprion metaphor does occur in a sexual setting on early epigraphs and on one sculpture from Khajuraho. It is suggested in this note that the scorpion is a hieroglyph representing a major component mineral ore used by a blacksmith/artisan working with metals. Tehran, 12 October 2005 (CHN) – The recent excavations in Rabat Teppe archaeological site in Sardasht, Northwestern Iran, led to discovery of four icons of winged goddesses on bricks which belong to 3000 years ago. These are the first ever winged goddesses found in Iran. In initial measures, the area of the archaeological site was believed to be 14 hectares but recent studies extend its measures to 25 hectares. “This season of the excavations has led to discovery of four winged goddesses in Rabat Teppe which can be traced back to the Iron Age, about 3000 years ago. This kind of icons has never been seen in any Iranian archaeological site before,” said Reza Heydari, an archaeologist of Western Azarbaijan Cultural Heritage and Tourism Organization. “These icons are unique and have no counterpart even in Persepolis. In Persepolis there is no sign of women,” he added. The most outward level of the site belongs to the first millennium BC. The archaeologists’ excavation which was started in current year September is an effort for a comparison of the site to the Mushashir’s civilization. Based on historical documents, one of the biggest ancient religion’s temples was based in the location. Mushashir civilization was contemporary with Urartu and Assyria. Due to political situations, Mushashirs sometimes allied with Assyrians or Urartu people. I find in this picture, three linear strokes on the top register. The woman has two wings emerging from the waistline. As you know, three linear strokes is a hieroglyh common in 'Indus script' which I have called Sarasvati hieroglyphs (not unlike Egyptian hieroglyphs, using rebus readings of homonyms). I couldn't figure out how a deer or cow is referred to. Maybe, haunch (loi and leg of a quadruped) is clear on the other three bricks. If this brick is an epigraph the hieroglyphs can be read (assuming links with Sarasvati hieroglyphs) as: kola 'woman'; rebus: kol 'alloy of five metals, furnace' er-aka =3D upper arm, wing; rebus: erako =3D molten cast; era =3D copper tebr.a, tebor. =3D thrice; rebus: tibira =3D copper merchant (Akkadian); ta(m)bra =3D copper (Pkt.) It will be interesting to inquire if any metal artefacts were found at the site. The only close-by civilization which was using epigraphs to convey messages was IVC (what I call Sarasvati civilization with 80% of archaeological sites on this river basin; cf. Kenoyer). Ligaturing was a unique artistic style seen on many Sarasvati hieroglyphs (seals and other inscribed objects of the so-called Indus script). 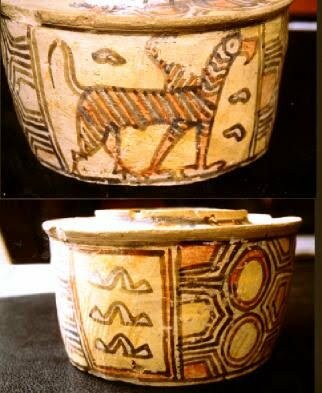 In a recent excavation at Harappa, a unique ligature of a tiger's face ligatured to the breast of a woman was found. [kol 'alloy of five metals', kol 'furnace'; kollan 'blacksmith'; rebus: kola 'woman'; kola, kolum 'tiger, jackal'.] See examples in albums at: http://spaces.msn.com/members/sarasvati97 The following URL shows a terracotta feline figurine with the body of a woman ligatured to the face of a tiger: http://www.harappa.com/indus/88.html *Material:* terra cotta * Dimensions:* 7.1 cm height, 4.8 cm length, 3.5 cm width Harappa, 2384 *Harappa Museum,* HM 2082 (Vats 1940: 300, pl. LXXVII, 67) If the ligature is that of a woman, wings and a deer, there may be some parallels with the depiction of antelope or ram on Sarasvati hieroglyphs in a metallurgical context of alloying.